High gain DSS LNBF with excellent performance and low power consumption. Rectangular fitting allows mounting to most DSS dishes. 40mm throat allows easy mounting to other dishes with LNBF throat clamp. Works with FTA and Dish Network receivers. Designed to pick up the 110 and the 119 dish. 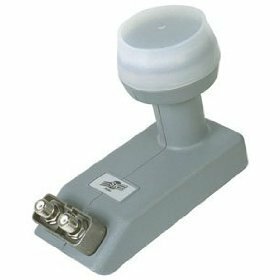 When used on a Dish 500 with a Legacy LNB you can pick up the 110, 118, and the 119 Satellite from the same Dish. Dual output allows you to use 2 receivers at the same time and recieve all the channels from both 119 and 118.7 at the same time. Skywalker Signature Series Pipe Adaptor 2.0 Inch O.d.